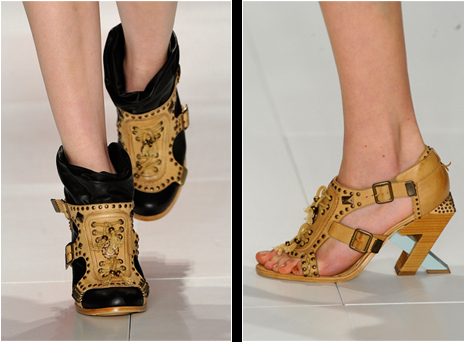 The warrior booties and sandals at the Herchcovitch show yesterday are so far the coolest and most interesting shoes I have seen in São Paulo this season. The heel is pretty amazing. Watch the entire Herchcovitch spring 2009 women's show on video after the jump. With only 23 looks, this was probably Mr. Herchcovitch's most concise show ever. The military theme which permeated his men's show was also present here, but the women's stage was painted white as opposed to black, and the collection consisted of mostly camel and sherbet colors. The finale baby doll dresses with cascades of ruffles were some of the softest and most feminine pieces ever shown by the designer. Wow That is an awesome heel on that shoe! Good looking shoe too! I don't like it more than I do Balenciaga's gladiator, but it's nice.